Juices, spices, and meals prepped and delivered, plated and served. Delicious dinners, plated and served. 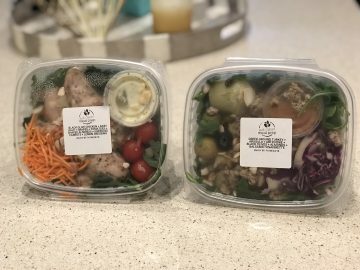 Started in 2015 by co-founders Eric Phelps and Bryn Butolph, they launched their meal prep delivery service in San Diego, with the mission to help San Diegans eat and live well – to save them time, stress, and conquer the unhealthy urge to hit the fast-food drive-thru when they just wanted convenient and easy meals. Their carefully crafted recipes and prompt delivery service are a success, and today, they’re one of the largest locally-owned and operated meal prep services in the country. Since 2015, they have delivered more than 150,000+ healthy meals to local residents and have expanded to several pickup locations throughout all of San Diego County. Eric reached out and offered to provide me with a week’s worth of meals, breakfast egg cups, lunch salads, pressed juices, and their custom-made seasonings, and I accepted with the promise of trying their meals and writing about my personal and honest opinions. Everything was conveniently delivered to my office location, and I made my first meal that same night. A variety of meals provided. Each meal I had was delicious, easy to heat and plate, and were filling, healthy, and tasted great. The press juices were all very good, making a perfect companion to the meal. The egg cups were surprising delicious, there’s more than just egg in them, and they are quick and easy to heat and eat right before work. The lunch salads were fresh, satisfying, and a perfect size. All in all, I had zero complaints, and I highly recommend giving Eat Clean Meal Prep a try. 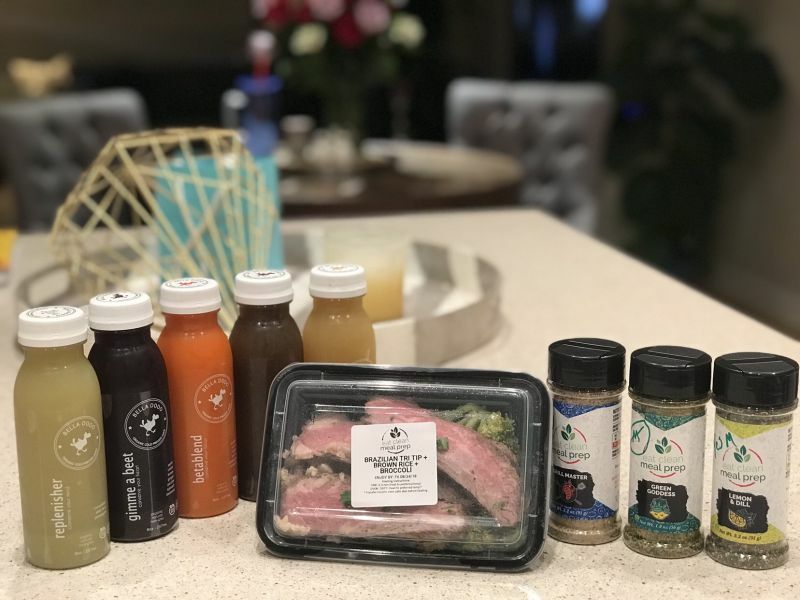 They offer a variety of proteins, vegetarian, and family plans, ranging in price from $57 to $64 per week for one-time deliveries, with breakfast and juice options as add-ons as well. Subscriptions are available and include a 15% discount. Compared to a meal ingredient delivery service like Blue Apron, Sun Basket, Hello Fresh, and others, where you get a bunch of ingredients, have to store and protect them from roommates for days, and then cook everything following their custom recipes, then plate, eat, and finally clean up the pots and pans, stovetop, knives and cutting boards, Eat Clean Meal Prep is so much easier, quicker, and actually often healthier. A pre-cooked meal delivery service like Freshly is a more apples-to-apples comparison, with both services delivering meals ready to heat, but I don’t like the subscription model, where I was worried to postpone a week’s delivery when I was traveling, and a few times I forgot until it was past their delivery cut-off, and had to scramble to eat all the meals I had in the fridge before they went bad. I prefer Eat Clean Meal Prep‘s delivery or pickup options, their cutoff dates are reasonable and not so far ahead of time, and I can order 1, 2, or more weeks if I want, as I prefer, without being on their schedule – they work around my schedule. I hope you enjoy their healthy meals and juices as much as I did, and tell them I sent you if you do. They’re a great locally-owned and operated business, and they’ll treat you like the VIP you are! They also offer DIY Meal Prep Products. Juices, spices, and meals prepped and delivered. Breakfast, lunch, and salad options too.